Strictly speaking. Said Dal 1923 does not do afternoon tea in the traditional sense. Said Dal 1923 does, however sell tea and the most delicious cakes. Plus, I did visit Said Dal 1923 during the afternoon..so technically, it was afternoon tea! 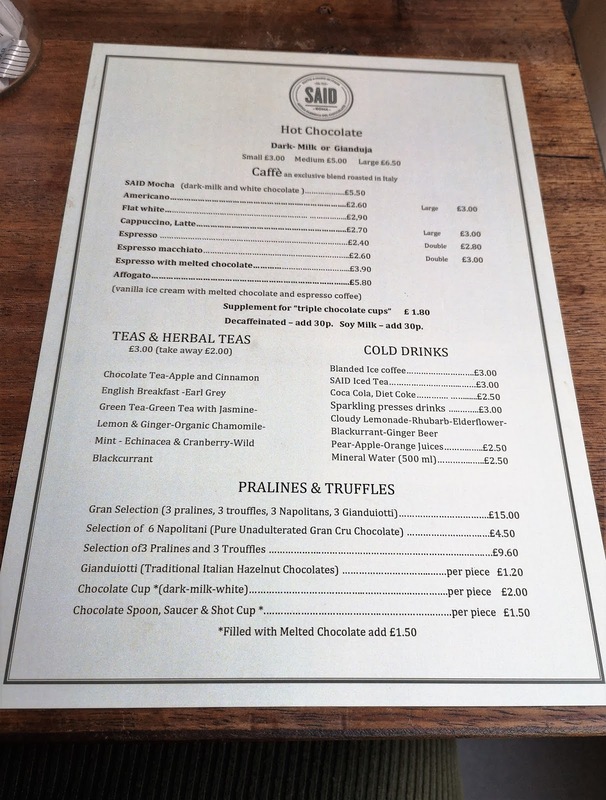 I'm a bonafide chocoholic and Said Dal 1923 has been on my London food and drink bucket list for some time now. It was well worth the wait, as Said Dal 1923 did not disappoint. It was a bitterly cold London day when I visited Said. The start of winter. A day that called for hot chocolate. But not just any old hot chocolate would do. Special. Premium hot chocolate that only Said Dal 1923 could deliver. 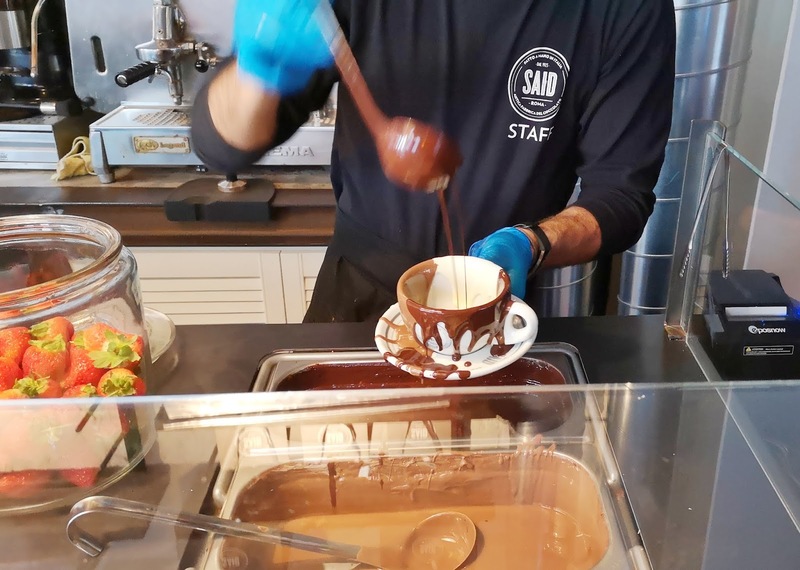 Said London have long been praised for serving up some of the best hot chocolate in London. Since hot chocolate season is now in full swing. I decided this was the perfect time to put Said Dal 1923 hot chocolate to the test. Probably the only thing I love about winter in London is snuggling up with a tasty hot beverage. Said London is a luxury, artisan chocolate shop. Famed for being the oldest chocolatier in the capital of Italy - Rome. I visited the Fitzrovia branch of Said in London. Hoping for a less busy atmosphere than the more popular Soho branch of Said London. I was in luck! Said Dal 1923 has a snug, classy and romantic vibe. It is Italian after all! Said Dal 1923 is a cafe. Coffee shop and chocolatier rolled into one. With two branches located in bustling central London. After seeing some amazing looking photos of Said hot chocolate and their other chocolate dipped treats. I couldn't wait to indulge in some chocolate decadence for myself. Said Dal 1923 also sell a large variety of their own luxury chocolates. You can buy and take home anything from chocolate bars. Drinking chocolate. Cocoa powder. Cakes and pastries. Said Dal 1923 products would make the perfect gift for any occasion. Said is the perfect London location for a date, or even just some self indulgence. During our visit. 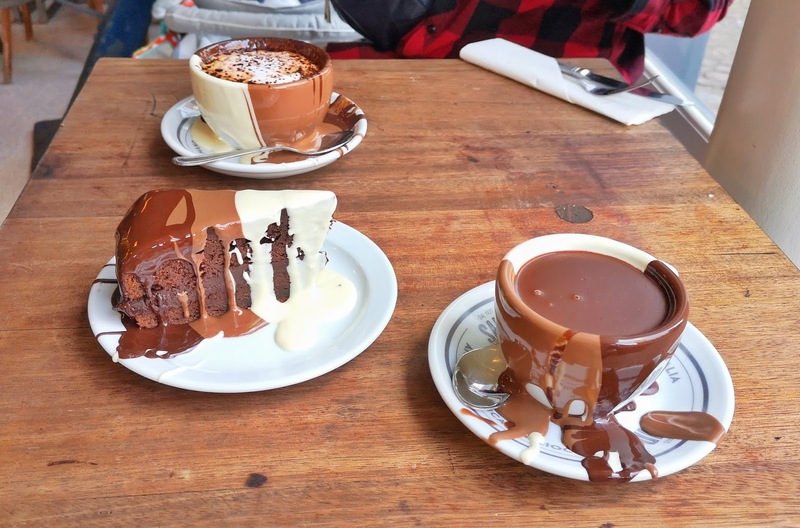 Romantic piano music played through speakers in the background, whilst we took sips from our chocolate smothered cups. I was spoilt for choice at Said London. In terms of hot chocolate, you can either enjoy a regular or large white hot chocolate. Milk hot chocolate. Dark. Or hazelnut hot chocolate beverage. I played it safe and went for the milk hot chocolate. All hot chocolate options at Said come with a cup that's slathered in a trio of thick, melting white. Dark and milk chocolate sauces. I couldn't help but scoop up the tasty chocolate sauces that stream down the outside of the cup. It really does look, and taste impressive. If you would like to enjoy your hot beverage of choice with the extra special triple chocolate cup at Said Dal 1923. (Why wouldn't you!) Make sure to request it, as it's an additional treat that incurs a supplement fee. The one negative I have to report on is that the service we received at Said Dal 1923 wasn't very good. There was no warm friendliness or enthusiasm received from the staff at Said Fitzrovia. Either when engaging with us or when seen serving other customers. I hope you receive better service on your visit to Said Dal 1923. Whilst the service you can expect to receive is nothing like that of a traditional London afternoon tea. Don't let this put you off going, as the quality and presentation of the chocolate products more than make up for it! The venue itself was impeccably clean. I didn't use the toilets during my visit. So I'll report on them in my next review of Said London. The premium coffee used at Said London is an exclusive blend roasted in Italy. Said cakes are homemade. With delicious options like carrot cake, crumble and cheesecake. It doesn't end there for chocolate lovers! Take your pick from mouth watering tiramisu. Waffles. Profiteroles. Doughnuts and more. All with a hefty serving of chocolate of course! 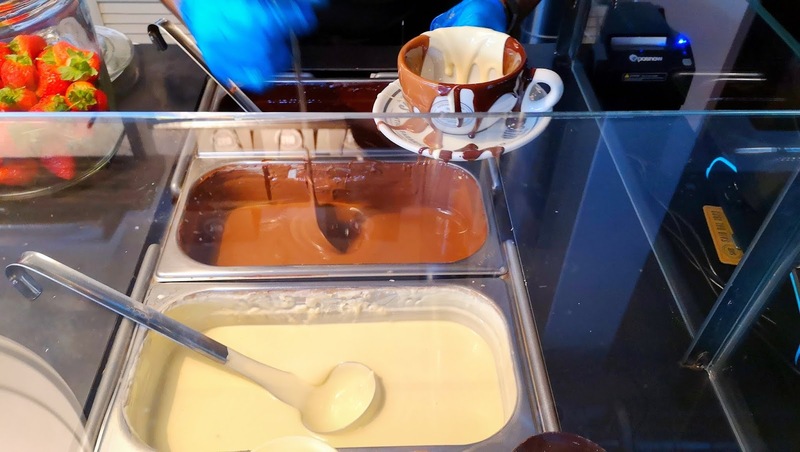 In the summer you can enjoy chocolatey milk shakes, ice cream or affogato at either one of the Said London branches. Affogato is a vanilla ice cream with melted chocolate and espresso coffee. I haven't yet had the privilege of trying this treat but will share my verdict on this blog when I do. Click here to subscribe for future blog updates. The hot chocolate at Said Dal 1923 is one of the best hot chocolate drinks I've ever had. Said hot chocolate has the most perfect. Creamy consistency, and just the right amount of sweetness. Many products at Said Dal 1923 are available as dairy free options. Substituting with soy milk. To compliment my mouth watering hot chocolate. I enjoyed a slice of Said chocolate cake. The chocolate cake comes with the option of being drenched in a trio of chocolate sauces. Just like Said Dal 1923 hot chocolate drinks. The chocolate soaked chocolate cake made for a beautiful looking treat, that tastes as good as it looks. Hubby had a slice of Margarita pizza from the menu at Said. Along with a mocha, which also comes in a cup that's drenched in triple chocolate sauce. Yum! I was too full to try some chocolate dipped strawberries but look forward to enjoying them on my next visit to Said Dal 1923. I honestly can't wait to go back to Said. Found this review of Said Dal 1923 Fitzrovia chocolate artisan shop useful? Subscribe to www.bestafternoonteainlondon.co.uk for more food and travel tips. This is a review of Said Dal 1923 London Fitzrovia. Said Dal 1923 is the oldest chocolate factory in Rome. 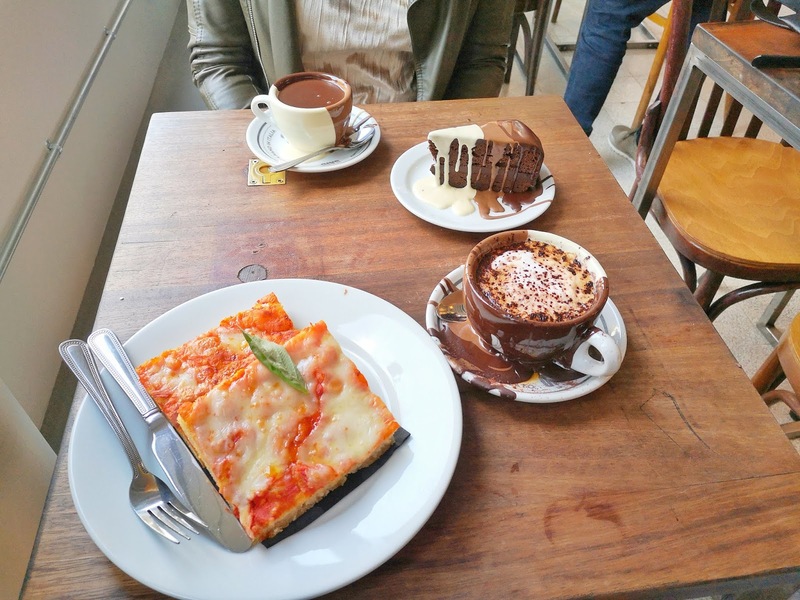 With two chocolate and coffee shops in the heart of London. The menu at Said Dal 1923 during the time of visit and at the time of this post includes dairy and dairy free options. All information was correct at the time of listing. Further details taken directly from the Said Dal 1923 website are as follows : Telephone : (+44) (0)20/75809530 ADDRESS: 29 Rathbone Place, London W1T 1JG (UK) OPENING HOURS Monday – Friday 08:00 – 20:00 Saturday 10:00 – 22:00 Sunday CLOSED The photos of food in this blog post are originals, which were taken at Said Dal 1923 London. Along with any text and personal opinions about Said Dal 1923 - Rathbone place branch and menu are copywritten by the owner of www.bestafternoonteainlondon.co.uk The photographs and text on this blog must not be copied. Distributed. Sold or printed without prior written consent of this travel and lifestyle blog owner. contact the site owner for more details.